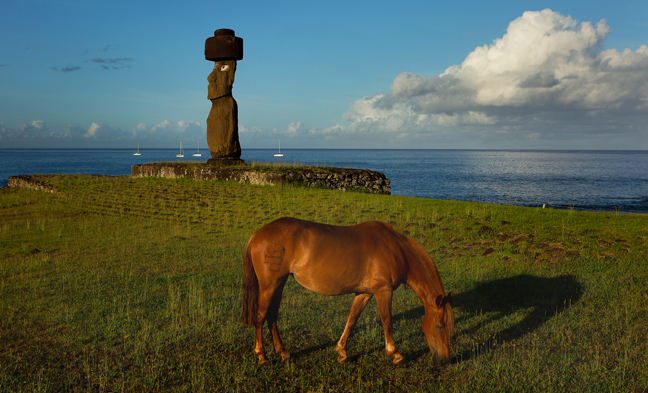 This moai, in front of the small bay of Hanga Kio'e, was likely constructed sometime before 1600 AD and moved more than 15 miles from the quarry at Rano Raraku to this site about one mile north of Tahai on the island's southwest coast (1/2). This moai, in front of the small bay of Hanga Kio'e, was likely constructed sometime before 1600 AD and moved more than 15 miles from the quarry at Rano Raraku to this site about one mile north of Tahai on the island's southwest coast (2/2). Archeologist William Mulloy and his teams restored the three platforms at Tahai in Hanga Roa between 1968 and 1970. Malloy, a distinguished professor of archeology at the University of Wyoming, first came to the island with Thor Heyerdahl in 1955 and made more than 20 subsequent trips to the island. His ashes are buried at the southern end of the Tahai complex and his extensive personal collection of books formed the basis for the island's nearby William Mulloy Library. 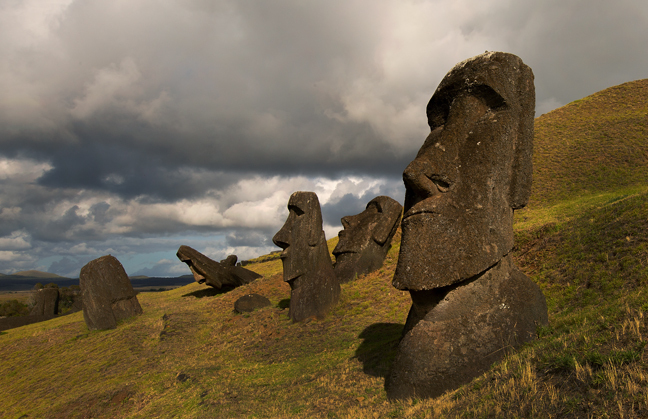 Ahu Ko Te Riku, the northern most of the three platforms, supports the only moai with a replica set of eyes. After the discovery of a white coral eye at Anakena in 1978, a replica set of eyes was made and added to this moai. Ahu Vai Uri and Ahu Tahai are to the left of Ahu Ko Te Riku as viewed from the front. 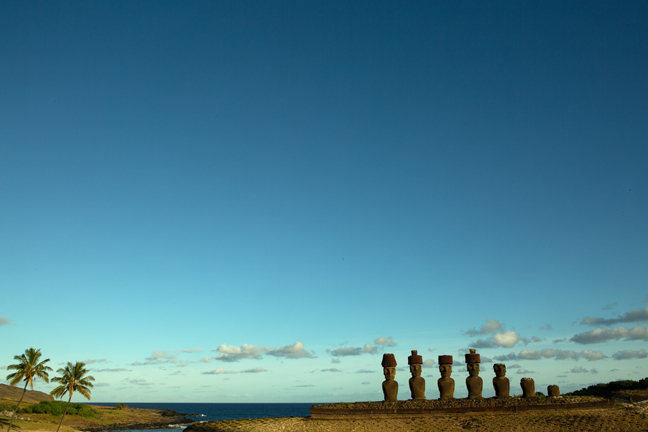 Every upright moai on the island is the result of archeological restoration during the 20th century as all moai on the island were toppled during tribal conflicts (1/2). 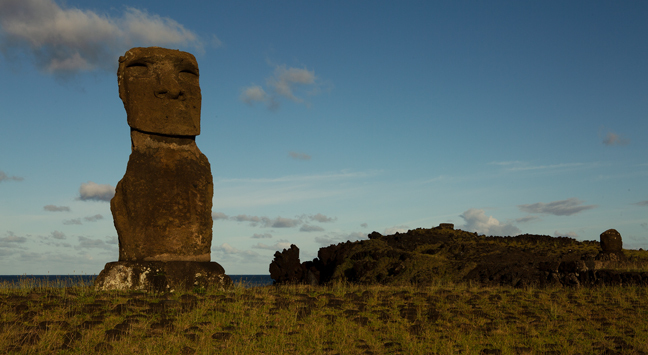 Ahu Ko Te Riku, the northern most of the three platforms, supports the only moai with a replica set of eyes. After the discovery of a white coral eye at Anakena in 1978, a replica set of eyes was made and added to this moai. Ahu Vai Uri and Ahu Tahai are to the left of Ahu Ko Te Riku as viewed from the front. 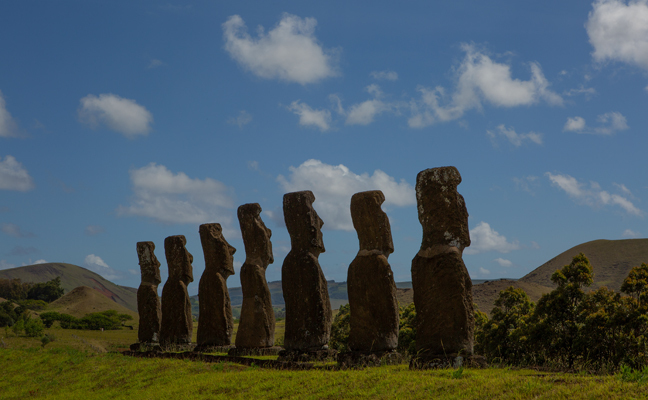 Every upright moai on the island is the result of archeological restoration during the 20th century as all moai on the island were toppled during tribal conflicts (2/2). Between Ahu Vai Uri and Ahu Tahai, with Ahu Ko Te Riku in the background, is one of the island's outrigger canoe ramps. The beach at Anakena was the religious headquarters of the royal Miru tribe. Today it is covered with palm trees imported from Tahiti in the early 1960s. Ahu Nau Nau was restored in 1978 by local archeologist Sergio Rapu and it was during this excavation that a white coral eye was found. The moai here are among the island's best preserved as the statues were buried in sand and protected from the elements after being overthrown. The single moai to the right of Ahu Nau Nau is the first moai on the island to be re-erected. In 1956, Thor Heyerdahl's team used long poles to lever the moai from the ground, placing stones underneath it for support. It took 18 days to restore the statue to its upright position. Heyerdahl explored and tried to replicate methods used to both erect and transport moais. Rano Raraku is one of two sites within the National Park that you are only allowed to access once on your required $80 US 10-day entry permit. The other is the Orongo village site. This is definitely the most annoying of the many Park policies as the Quarry contains 397 moai in various stages of carving and transport, including the largest known moai ever carved. They face in every direction and throughout the day are in various stages of light and shadow. It would take at least a couple of mornings and a couple of evenings of nice light to properly document this amazing site. The morning we had was cloudy with only rare bits of filtered sunlight between raindrops. I had hoped for a rainbow, but just got flat and uninteresting light. Of course, the site doesn't open until 9:30 a.m., so the preconceived notion of soft morning light in the quarry was an illusion anyway. We were told that Chileans visiting the island had been re-selling their Park passes after visiting the quarry and thus the restriction had been imposed. After travelling more than 8,500 air miles to visit Easter Island, it was particularly frustrating to find that most locations opened two-three hours after sunrise and closed two-four hours before sunset. Every archeological site on the island is considered to be within the Park, but access hours to each vary greatly and no one seems to really know when sites open or close and even the posted hours are not followed. None of the moias in Rano Raraku crater have carved eye sockets. Only after moais were erected were their eye sockets carved. This was thought to revive the ancestor's mana and bring his spirit back to life. Moai were carved on their backs within the bedrock. Only after the face, torso and arms were completed were they chipped away from the rock high on the cliff and lowered into prepared pits to be stood up, giving carvers access to their backs. Most of the moai heads visible in the quarry have their bodies still buried beneath them in their original pits, so you can actually only see about 25 percent of these moai. Moai took up to two years to carve from the hardened volcanic ash found in the crater, which was the origin place of all of the moai on the island (1/2). None of the moias in Rano Raraku crater have carved eye sockets. Only after moais were erected were their eye sockets carved. This was thought to revive the ancestor's mana and bring his spirit back to life. Moai were carved on their backs within the bedrock. Only after the face, torso and arms were completed were they chipped away from the rock high on the cliff and lowered into prepared pits to be stood up, giving carvers access to their backs. Most of the moai heads visible in the quarry have their bodies still buried beneath them in their original pits, so you can actually only see about 25 percent of these moai. Moai took up to two years to carve from the hardened volcanic ash found in the crater, which was the origin place of all of the moai on the island (2/2). Ahu Tongariki is the largest ceremonial structure in Polynesia with a length of almost 725 feet. 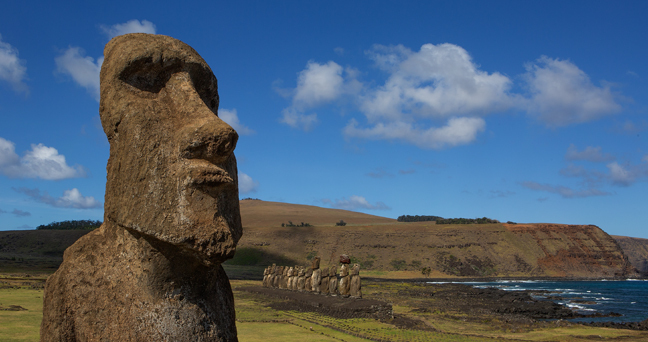 It supports 15 moai and was restored between 1992 and 1996 by Chilean archeologist Claudio Cristino and a team from the Universidad de Chile. In addition to being toppled centuries ago, the moai at Tongariki were then scattered across hundreds of yards in May 1960 by a tsunami that resulted from the most severe earthquake ever measured. 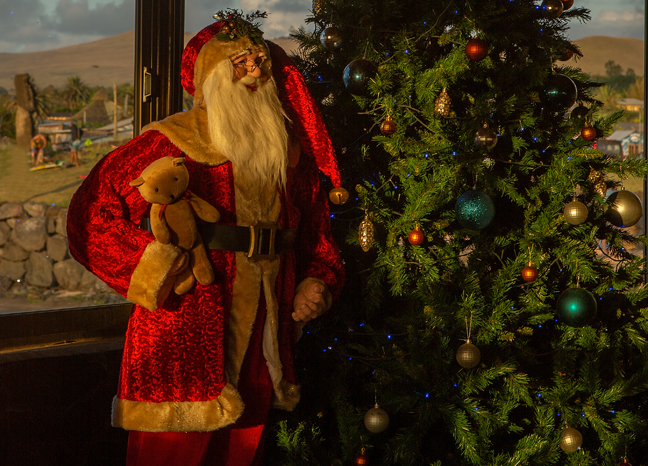 It measured 9.5 on the Richter Scale and struck the Chilean coast near Valdivia. The government of Japan and Tadano, a private Japanese construction company, paid for the restoration project. The single moai at the entrance to the site is now known as the Travelling Moai, after its journey to and return from Japan. It was also used by Thor Heyerdahl to test his theory of how the moai were moved from the quarry to sites around the island (1/4). The government of Japan and Tadano, a private Japanese construction company, paid for the restoration project. The single moai at the entrance to the site is now known as the Travelling Moai, after its journey to and return from Japan. It was also used by Thor Heyerdahl to test his theory of how the moai were moved from the quarry to sites around the island (2/4). The government of Japan and Tadano, a private Japanese construction company, paid for the restoration project. The single moai at the entrance to the site is now known as the Travelling Moai, after its journey to and return from Japan. It was also used by Thor Heyerdahl to test his theory of how the moai were moved from the quarry to sites around the island (3/4). The government of Japan and Tadano, a private Japanese construction company, paid for the restoration project. The single moai at the entrance to the site is now known as the Travelling Moai, after its journey to and return from Japan. It was also used by Thor Heyerdahl to test his theory of how the moai were moved from the quarry to sites around the island (4/4). Orongo is perched between the rim of Rano Kau's crater and 1000-foot cliffs down to the Pacific. 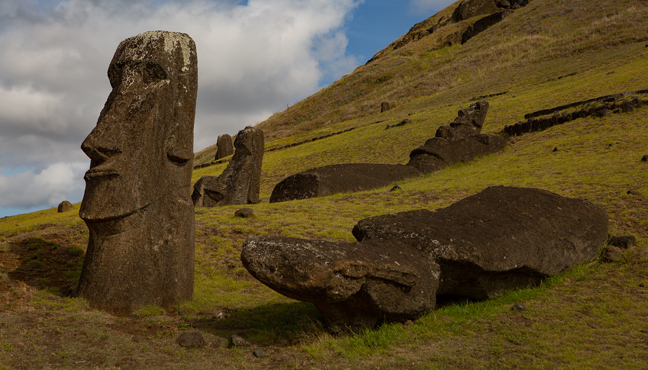 It was used during the moai period for various ceremonies and coming-of-age rituals. There are no moai in this part of the island as it was uninhabitable year-round in spite of having a large source of freshwater within the crater. There are 54 houses, restored by William Mulloy and a team of islanders in 1974, that make up the ceremonial village of Orongo. These houses were used for sleeping or protection from bad weather. This is Easter Island's premier petroglyph site with more than 1700 known petroglyphs, although access has been prohibited for several years as erosion is slowly destroying the site. The World Monument Fund included Orongo on their list of the world's 100 Most Threatened Sites during the late 1990s (1/2). There are 54 houses, restored by William Mulloy and a team of islanders in 1974, that make up the ceremonial village of Orongo. These houses were used for sleeping or protection from bad weather. This is Easter Island's premier petroglyph site with more than 1700 known petroglyphs, although access has been prohibited for several years as erosion is slowly destroying the site. The World Monument Fund included Orongo on their list of the world's 100 Most Threatened Sites during the late 1990s (2/2). William Mulloy and Gonzalo Figueroa restored Aku Akivi in 1960. It was the first full platform excavation to take place on Easter Island. The site is inland 1.8 miles from the coast and yet the moai face the sea, but this is not unusual as the farming village they watched over was between the site and the sea. 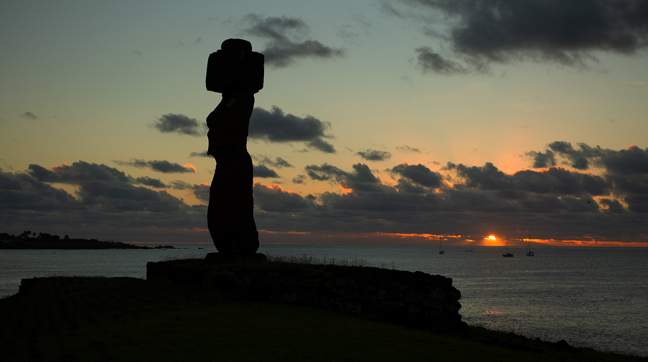 Ahu Akivi is aligned with certain stars during the equinoxes and is one of at least 15 platforms on the island that are aligned with celestial events. The site also houses two cremation pits, one of which Mulloy found filled with burnt human bones and burial offerings. From inside Pea Restaurant looking out onto Pea Beach and the ceremonial platform of Ahu Tautira in downtown Hanga Roa. Akahanga is an unrestored site whose main platform once supported 12 moai. 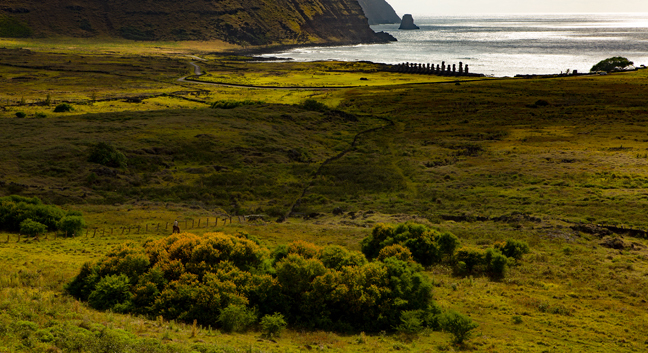 Just west of Akahanga is Ura Uranga Te Mahina where four well-preserved moai lie face down in front of their platform. Of the 887 documented moia on the island, fewer than 50 have been re-erected. Locals think this is enough to continue the flow of tourism dollars. 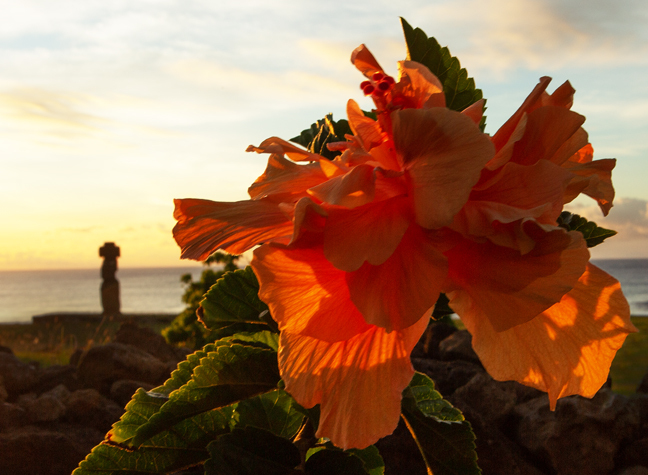 This moai now overlooks the Plaza Hotumatua on the edge of Hanga Roa where there are numerous shops and restaurants, the main fishing pier, a small swimming area, access to the surf, a dive shop and an ice cream cafe. 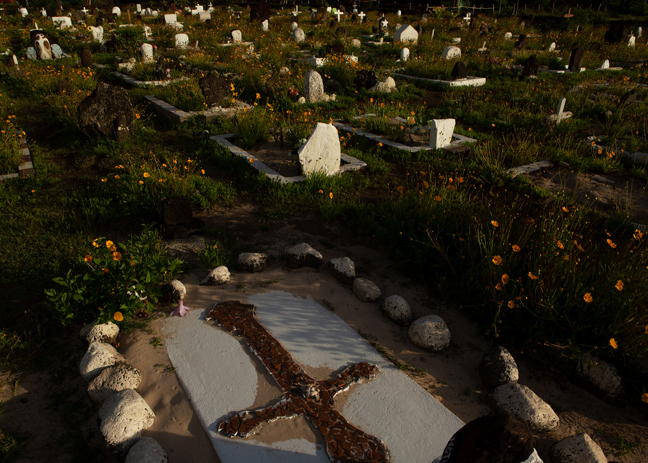 The current Tahai cemetery, opened in 1951, is located on Policarpo Toto Street in Hanga Roa just 100 feet from the sea. It is the fourth Catholic cemetery on the island. It contains figures of moai, the divinity Make Make, reliefs of the Birdman and wooden benches engraved with imitation Rongo Rongo tablets.